Prairie will bounce back in Oakland Township! 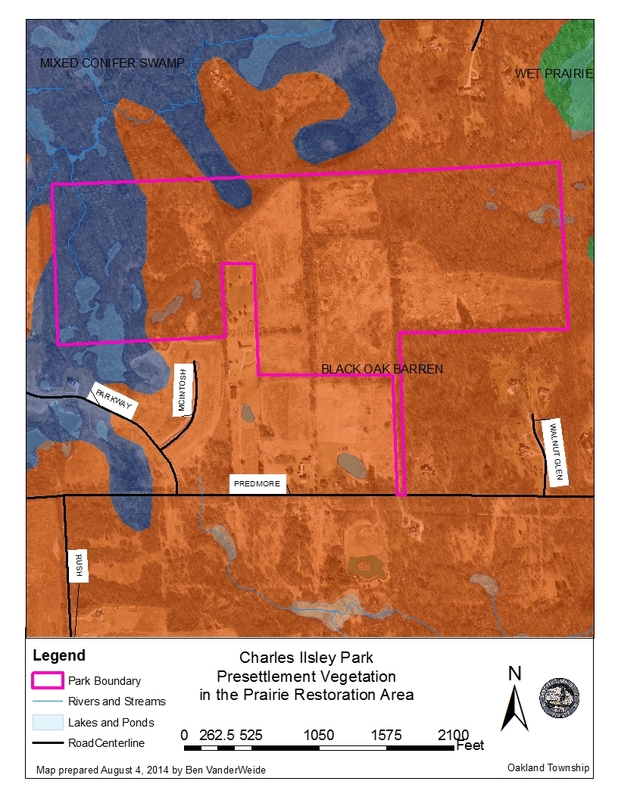 We will receive $15,200 from the US Fish and Wildlife Service to restore 18 acres of old farm fields at Charles Ilsley Park and 20 acres at Draper Twin Lake Park to native prairie and oak barrens. Currently non-native invasive shrubs such as autumn olive and multiflora rose are taking over the fields. We want to replace these plants that have little value for wildlife habitat with high-quality native vegetation that will be beautiful, attract grassland birds, and help us learn about what much of Oakland Township used to look like. Read on to learn more about this opportunity, and check out the maps below to see where the restoration work will happen. I will be posting information about the restoration process, progress updates, and other prairie news in the next few months, so check back often to learn more. Why prairie in Michigan? Did we used to have prairie here? When we think about prairie, we usually think of the Great Plains and the vast expanses of grassland where buffalo roamed and cowboys rode. But grasslands used be widespread in our area of Michigan! Before European settlement in the 1800s, prairie and oak barrens covered about 67% of Oakland Township, making our township a special area in Michigan. Oak barrens have widely spaced black and white oaks, with prairie plants in open, sunny areas and woodland plants in partially shaded areas. Prairie and oak barrens are fire-dependent, which means that they need to be maintained by frequent, low-intensity fire to keep trees from establishing and shading out the sun-loving prairie plants. As Oakland Township was developed, nearly all of our oak barrens and prairies were lost. Some were plowed because they didn’t have many trees, and other disappeared because the fire they needed to survive never came. When Michigan was originally settled, land surveys were done so that it could be sold to settlers. At each corner, the surveyors made field notes which included locations of lakes, rivers, and streams, and the quantity and quality of timber resources. From these field notes, soil maps, and geology maps, biologists did their best to re-construct what plant communities were present before the area was settled. You can click here to learn more about pre-settlement vegetation maps (website from the Michigan DNR). 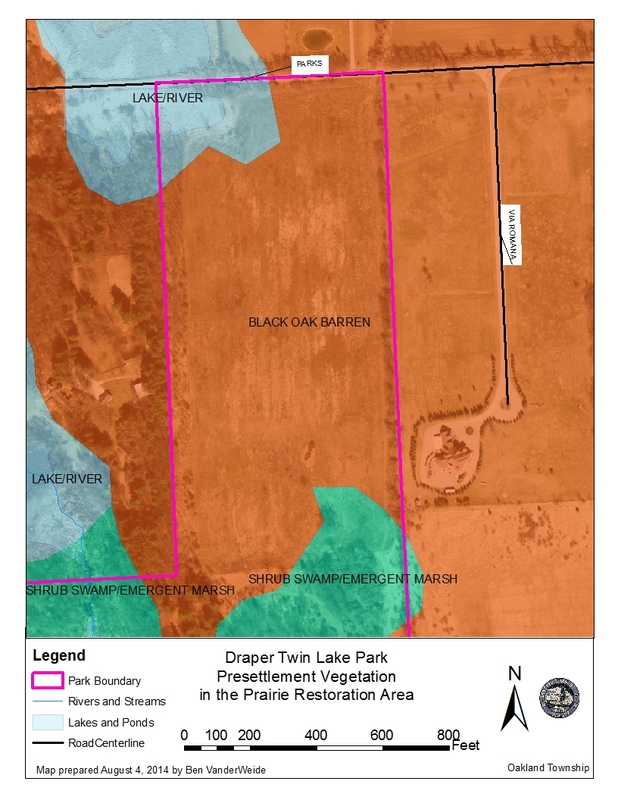 Pre-settlement vegetation map for northeast Draper Twin Lake Park. Orange areas were originally oak barrens. Pre-setttlement vegetation map for Charles Ilsley Park. The areas in orange were originally oak barrens. Do we have any prairie left in Oakland Township? We do have a few pockets of prairie left in the township, mostly along the Paint Creek Trail. The sparks from the railroad lit fires that burned through the prairie grasses. We find many interesting prairie plants and insects in these areas, but most of just barely hanging on. Trees are slowly shading them out, the open patches are becoming smaller and smaller, and the prairie life that depends on those patches is disappearing. Since prairies are part of our natural heritage, it is very important to do what we can to protect and maintain these prairie pockets. One of the finest examples is the Paint Creek Heritage Area – Wet Prairie just north of Silverbell Road. 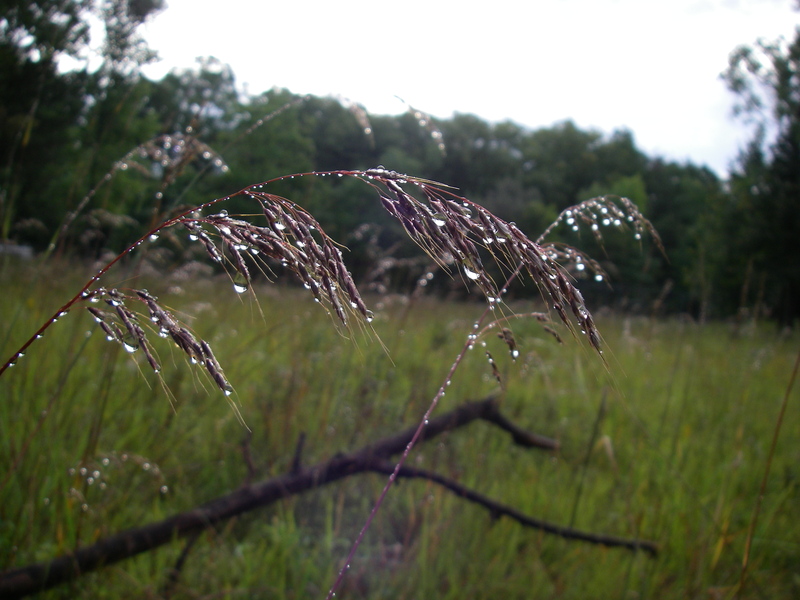 Indiangrass (Sorghastrum nutans) at Paint Creek Heritage Area – Wet Prairie. What will the restored prairie look like? Planting a prairie is like a planting a tree: it takes a while for the prairie to “grow up.” After we remove the existing plants, the fields will be seeded with a mix of native prairie species. The first two years after planting, the prairie plants will be small above-ground as they use most of their energy to grow roots. After the third year prairie plants will become more obvious and you will begin to notice soft pink blossoms of Carolina rose in early summer, orange butterfly milkweed lending a mid-summer splash, purple spikes of rough blazing-star providing fall color, and iconic grasses such as big bluestem and little bluestem swaying in the wind on the hillsides. As the prairie matures, we hope that grassland birds, such as meadowlarks, dickcissels, and bobolinks will discover our prairie. Our Paint Creek Heritage Area – Wet Prairie provides a small taste of the grasslands that used to cover Oakland Township. 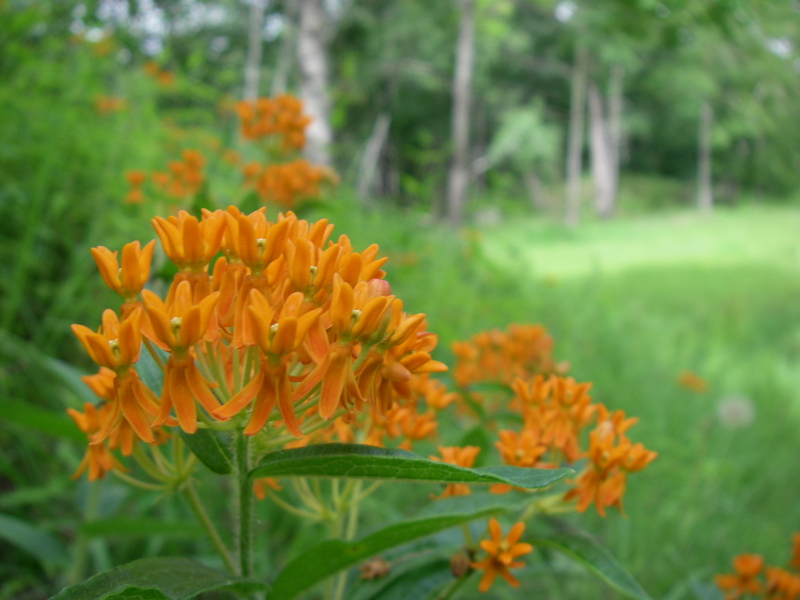 This butterfly milkweed (Asclepias tuberosa) is common at the Wet Prairie. We have seeds and soil, but we need you to help us establish our prairie! You can help the prairie thrive by collecting native plant seeds at a stewardship workday, assisting with site preparation, and helping with prairie maintenance after planting. No special experience necessary! Contact Natural Areas Stewardship Manager Ben VanderWeide for more information. To learn more about the Partners for Fish and Wildlife program, visit http://www.fws.gov/midwest/partners/.